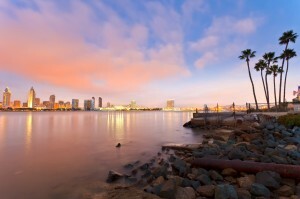 Mark your calendars, the 2017 US Go Congress dates and location have been confirmed as August 5-12 at the Town and Country Resort in San Diego. Centrally located in San Diego’s Mission Valley, the Town and Country Resort will offer newly remodeled tower rooms or less expensive garden rooms, “all virtually next door to the ballroom, where the US Go Open will be played, and the classroom space, where the pros will give lectures and analysis,” reports Ted Terpstra, who will co-direct the Congress with Les Lanphear, both of the San Diego Go Club, which is hosting the Congress. 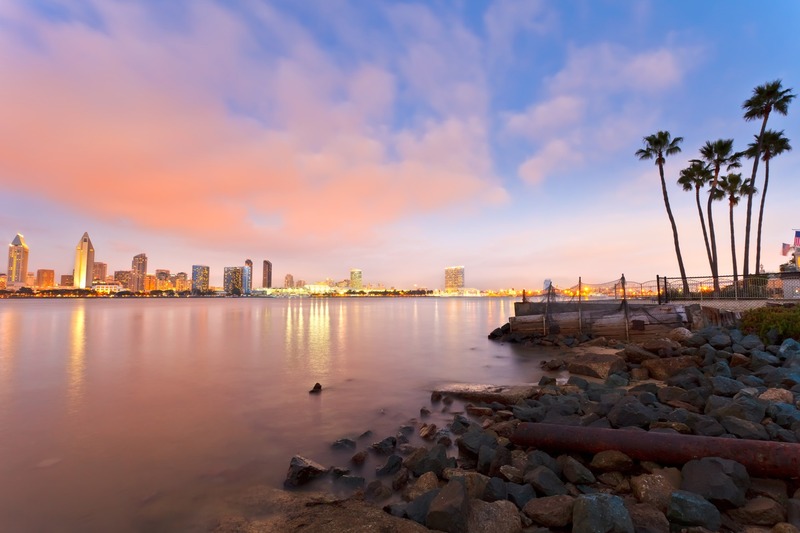 Town and Country is a ten-minute drive from many of San Diego’s major attractions, including beaches on the Pacific Ocean, Seaworld, San Diego’s world-famous zoo and Balboa Park, with its nine museums. Congress registration is expected to open soon. Meanwhile, be sure to take the brief Go Congress survey to weigh in on your favorite Congress activities as San Diego organizers begin planning for 2017! Pre-registration for this year’s Cotsen Open — October 22nd-23rd in Los Angeles — closes on Tuesday, October 20th. Players who pre-register get a discounted $20 entry fee, free food truck lunch on both days and a full refund of the entry fee if they play in all five games; click here to register. Day-of registration will also be available for $25. The Cotsen Open features thousands of dollars in prizes, an extremely competitive Open Division, free masseuses to massage players during their games, and a demonstration game between Yilun Yang 7p and Guiyong Liao 9P. The EJ will provide live KGS commentary on top board games as well as streaming coverage on the AGA’s YouTube channel. Fujisawa has sole lead in Women’s Meijin: A key game in the first half of the 29th Women’s Meijin League took place at the Nihon Ki-in in Tokyo on September 22. In a clash between the joint leaders, Fujisawa Rina 3P (B) beat Okuda Aya 3P by 1.5 points. Fujisawa improved her score to 3-0 and has the sole lead. However, she is only halfway to the goal. Of the seven league members, three have already played three games, but three have played only one. Fujisawa has an edge, but all seven players are still in the running. King of the News Stars begins: The first game in the best-of-three final of the 41st King of the New Stars tournament was played at the Kansai Ki-in headquarters in Osaka on September 22. 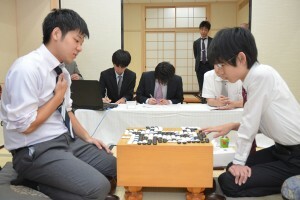 Onishi Ryuhei 2P (aged 16, at left) (W) of the Nihon Ki-in beat Taniguchi Toru 2P (aged 20) of the Kansai Ki-in by half a point. This was a regrettable loss for Taniguchi: he held the lead for most of the game, but missed all his chances to wrap up a win. In the end, he suffered an upset loss by the narrowest margin. The second game will be played on September 30. 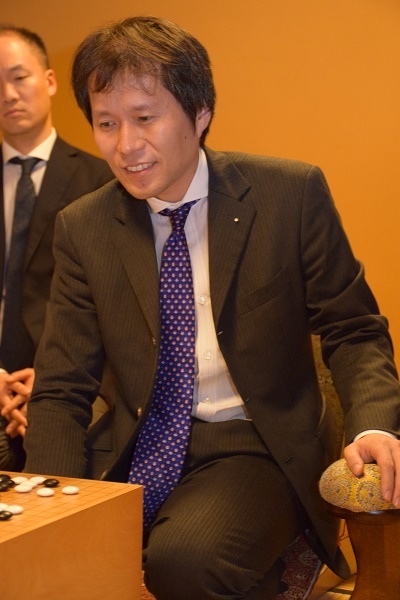 Agon Kiriyama Cup: The final of the 23rd Agon Kiriyama Cup will feature a clash between two veteran players: Cho Chikun (60) and Kono Rin (35). Cho previously won the 9th Cup; Kono reached the final of the 21st Cup, but lost to Iyama Yuta. In the semifinals, Cho beat Murakawa Daisuke and Kono beat Yamashita Keigo. Unfortunately, the founder of the tournament, Kiriyama Seiyu, died on August 29 at the age of 95. He founded the Agon sect of Buddhism in 1978 and has been a strong supporter of go in Japan and China. Chen makes good start in Bailing final: The best-of-five final in the 3rd Bailing Cup started in Yunnan Province in China on September 22. The 19-year-old Ke Jie 9P was the favorite, as he is China’s number one and he won the previous Bailing Cup, but his compatriot Chen Yaoye 9P, who is all of 26, has made an excellent start, winning the first two games. Chen had black in the first game and won by resignation; in the second game, played on the 22nd, Chen secured a resignation after 178 moves. The match will resume in December. Several strong players from Kwon Gap Yong International Baduk Academy (KIBA) will be visiting the metro New York City area in October and intend to visit the two Go meetups, at the Hungarian Pastry Shop (10/11) and Pie by the Pound (10/12). On October 12 they will be playing a friendship match against strong players living in the area. “We are currently recruiting a team, with a few slots remaining,” reports Boris Bernadsky. If you are 4 dan or stronger and would like to participate, contact Badukboris@gmail.com. The Davis/Sacramento Go Club held their Fall Tournament on September 17 at the Arcade Library in Sacramento. There was a very small field of six players ranging from 1kyu to 7dan. It was won by Matthew Burrall, 7d, with a perfect 4-0 score. Takao sweeps to 3-0 lead in Meijin challenge, sextuple crown in danger: The second game of the 41st Meijin title match was held at the Kakujoro, a traditional Japanese inn, in Tahara City, Aichi Prefecture on August 14 and 15. 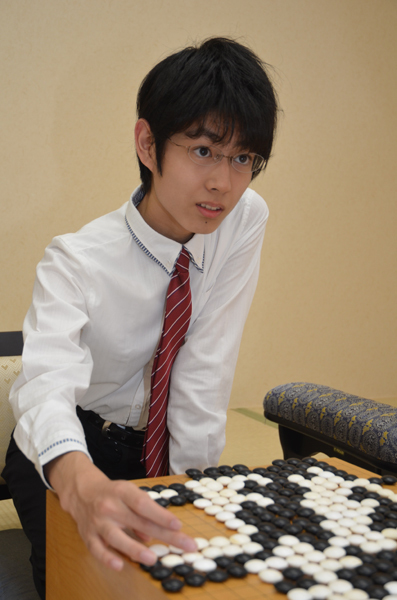 Playing black, Iyama Yuta set up a large moyo. Takao made an invasion, so the game became a contest between Iyama’s attack and Takao’s shinogi (ability to save a group under attack). In the end, Takao secured his group and took the lead. 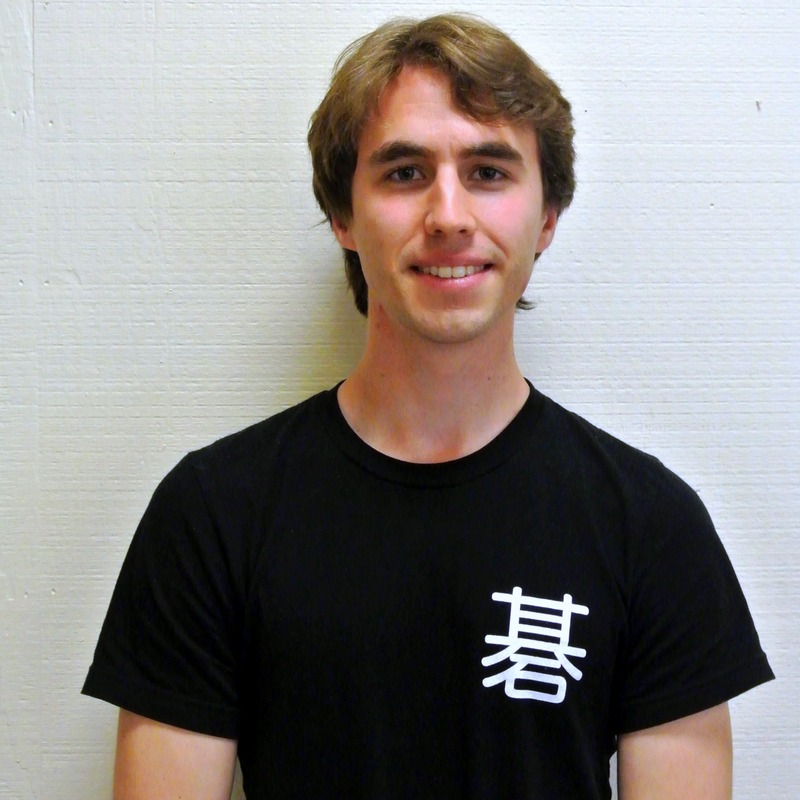 Iyama resigned after 236 moves. Iyama had made a bad start to the title match with two losses. In the past, he had played 17 best-of-sevens and 18 best-of-fives, but this was the first time he had lost the first two games. However, worse was to come. The third game was played at the hotel Thousand Pine Trees: The Numazu Club in Numazu City, Shizuoka Prefecture on September 20 and 21. Taking white, Iyama played aggressively, but Takao keep his cool and fended off the attack, building a lead in the middle game. In a desperate attempt to catch up, Iyama embarked on a shinogi strategy, taking profit and leaving a weak group for the opponent to attack. However, he was unable to narrow the gap; when Iyama resigned after Black 169, he was about ten points behind on the board. Takao seems to be in his best form for a while. He has a bad record against Iyama in the past and must be very pleased to make such a good start. 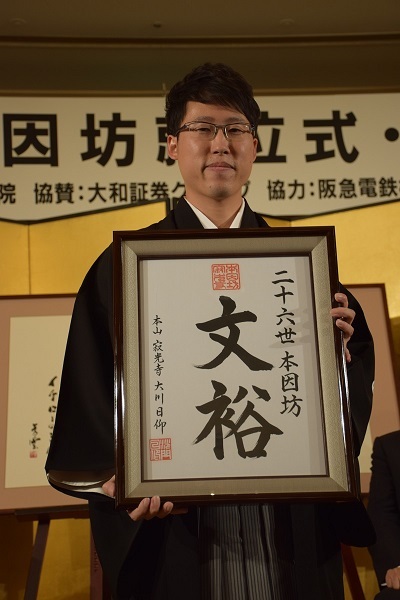 He needs just one more win to make a comeback as Meijin after a gap of a decade (he beat Cho U in the 31st title match and became Meijin Honinbo). The fourth game will be played on October 4 and 5. 9P (W), winner of the B2 League, defeated Cho Chikun 9P, winner of B1, by resig. The game was played on September 19. 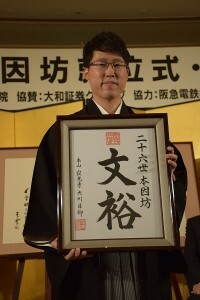 Yuki earns a place in the irregular knock-out (“paramasu”) tournament to decide the challenger; he will need to win five games in a row to make the title match. At present, this is how the knock-out looks. Shida Tatsuya 7P, C League winner, plays Yuki, B winner; the winner will played Cho U, A League winner; the winner will play either Yamashita Keigo 9P or Kono Rin 9P, second in S League; the winner will play either Kono or Murakawa Daisuke 8P, first in S League. The latter will start the nominal “best-of-three” with a one-game advantage, so he will need only win to become the challenger (although it’s called a “best-of-three,” three games can never be played: the first-place getter just needs to win the first or second game; the second-place winner can become the challenger only by winning the first two games). For Sale: Seven Go game themed original oil paintings, 12×16″, on canvas with wood frames. Purchased new from yunnan-arts.com about eight years ago. Email gerratt5@aol.com and I will send photos. All for $80 plus expedited shipping. Payment by PayPal only to confirmed address. This Saturday, the first New York Youth Team Go Championship will be held, reports Stephanie Yin. “This should be a regular yearly tournament for kids,” says Yin. This year, there were 15 teams that wanted to register, “however, we couldn’t fit them all so that I had to select ten stronger teams instead. Next year, I will definitely look for a bigger place.”The tournament is being hosted by the New York Institute of Go, “which is my go school,” says Yin, and is co-sponsored by the Queens Library, which is providing the space, and the Peking University Alumni Association of Greater New York, which provided the flyers. “We have just been invited to send a representative to the 7th Qionglong Mountain Bingsheng Cup World Women Weiqi Competition,” reports Cherry Shen. The tournament will take place from November 11th-17th (actual tournament dates: 12th-16th with single-knockout system). Eligible female players must be North American citizens or permanent residents. Flight and accommodation expenses will be provided to the player by the tournament organizers. If you are eligible and interested in representing North America at this tournament, please email cherry.shen@usgo.org with your name, rank, KGS name, and the best contact info to be reached at by no later than Wednesday September 28th. The online qualifier will take place on KGS with Skype on the weekend of October 1-2. The format of the selection games will depend on the number of players interested. 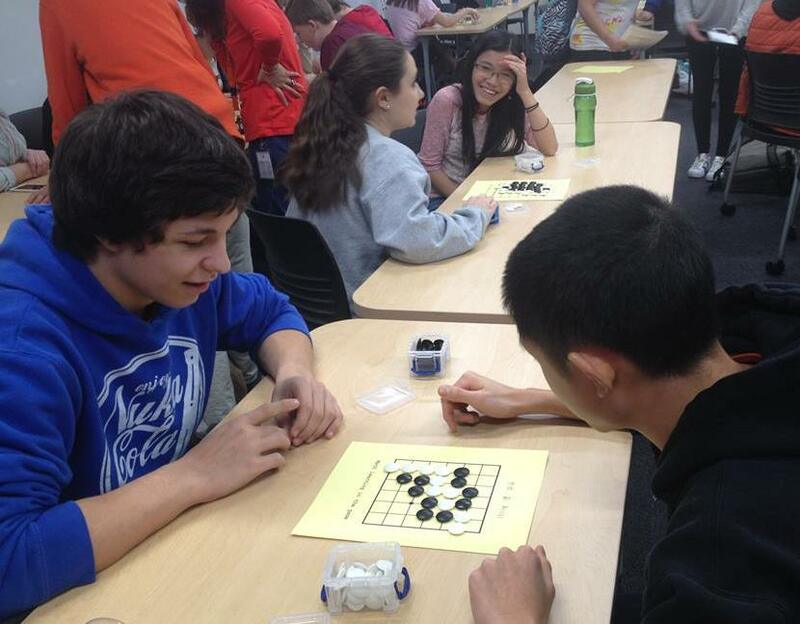 “About 3000 students in the Chicago Public Schools, and another 2,500 students from suburban districts, learned weiqi (go) during the last school year,” reports Xinming Simon Guo, 2015 AGF Teacher of the Year and founder of Go and Math Academy in Illinois. “Weiqi is not only an educational manipulative in the math classroom, but also a new way to extend the horizon of students in the language classroom,” adds Guo. September 17th was an Artist In Residence workshop day for Chinese language teachers in the Chicago schools. “We organize this annual workshop at the beginning of every new school year, to bring culture into Chinese language classrooms, and enhance language teaching and learning, ” says Jane Lu, director of the Confucius Institute in Chicago and the coordinator of the CPS Chinese World Language Program. Local artists are invited to present and demonstrate different types of Chinese cultural activities, including Kung Fu, Chinese folk dancing, Chinese painting, paper cutting, and weiqi. Teachers in the workshop can apply to introduce these cultural and art activities to their classrooms if they want to. “Weiqi has been the most popular project among Chinese teachers in Chicago Public Schools since its debut in 2013,” says Guo, “during the last three years, about half of the Chinese teachers have chosen weiqi for their students. After the latest workshop, several new teachers also showed great interest and planned to apply for more classroom instruction.” -Paul Barchilon, E-J Youth Editor Photo by Xinming Simon Guo: students in Arlington Heights learn go.